Caravana43 will visit more than 40 US cities this spring to spread the call for justice—and against US funding of the drug war. To be silent or to speak may constitute the difference between life and death. The life that comes from speaking, the life that comes from being silent; the death that comes from speaking, the death that comes from being silent. Midway on one of the major journeys of her life—the journey to find her son, Jorge—Blanca Luz Vélez Nava takes a moment to breathe. “I think of Jorge all day and all night, and I won’t stop until we get him back, until we find out the truth of what happened,” she says, while sitting on one of the granite slabs beneath the 300-foot campanile clock that marks the birth of the Free Speech Movement, the South Africa and the Central America solidarity movements, and other movements that fired political imaginations here at the University of California, Berkeley, in the 1960s, ’70s, and ’80s. “I’m halfway on this trip and I’m tired,” she continues, as she listens to a student strumming her guitar, “but I hear the young woman playing and I think of Jorge, because he loved to play guitar too. I see these young people and I feel happy knowing they support us and give us cariño [love].” Nava’s eyes light up as she looks toward the hundreds of students, faculty, and parents gathered solemnly in a circle, as if they’re protecting the delicate flames of the 43 small white votive candles forming the number “43” at the center of this outdoor event. Each flame is a reminder of Jorge and the 42 other student teachers from Mexico’s Ayotzinapa Teachers College, whose disappearance last September 26, along with six who were murdered, has inspired anger and indignation, as well as other, nobler sentiments—ones that start and sustain movements for social and political change. Such expressions of solidaridad surprised Nava from the moment she and the dozen other parents and fellow students of the 43 missing student teachers, called “Normalistas,” crossed the McAllen-Matamoros border into the United States on March 15. As West Coast representatives of the Caravana43, she and her colleagues say they are undertaking the one-and-a-half-month journey, visiting more than 40 US cities, in order to educate and agitate around the disappearances that have become emblematic of the larger crisis in Mexico, which has left more than 100,000 dead and more than 25,000 disappeared, many of whom, they say, were killed and disappeared by the Mexican government. The three-pronged Caravana (East Coast, Midwest and West Coast), she said, is also shining a light on the US government, which provides guns and training through Plan Mérida, the multibillion-dollar security aid package that Nava and other parents say is “being used to kill, hurt and disappear our children.” The three legs of the caravan will converge on New York City for a final rally on April 26 at the United Nations and other events there and in Washington, DC. Among the less apparent but truly unprecedented aspects of the Caravana43—and US-Mexico solidarity generally—is where the leadership of this new US movement is coming from: a US Mexican community, now over 35 million strong, whose border-smashing ties and larger sense of familia are altering US politics, forcing the United States to look southward while also influencing Mexico to look northward, often in powerfully intimate ways. These and other signs of the borderless movement’s birth shone all around Nava; student eyes bubbling with tears; freshman fists and voices raised in commitment to a causa that, for most, is their first political engagement; and, especially, the raising up of the compañeros, the desaparecidos, and other martyrs whose memory will fuel this fight into the precarious future. I had not seen these signs of powerful movement at Berkeley since mothers and students from El Salvador altered many young destinies with their testimonios in the 1980s. Their stories of struggle and hope, and their organizing against US-backed military dictatorships in Central America, changed life decisions and sustained what was, along with the nuclear-freeze, anti-apartheid and AIDS-activist movements, one of the more powerful social movements of that era. As in the 1980s, the encounters and organizing of the Caravana43 are translating into aid money, political accompaniment, and lots of activism. But unlike the ’80s campaign, we’re not talking about a movement led publicly by whites and rooted in a Salvadoran refugee population of less than a million. In the case of Mexico solidarity, today’s movement is rooted in one of the largest mass migrations in US history: Americans of Mexican origin, now approximately 11 percent of the US population, maintain regular, often daily contact with their homeland through vast social, political, and media networks operating across a contiguous border—and in large parts of the US side of that border, family cemeteries and old churches still bear the memory of having once been a part Mexico. These personal and political connections between the United States and Mexico were not lost to Angel Neri de La Cruz, a Normalista student and one of the survivors of last September’s fateful attack. On his way to the Berkeley event, de la Cruz carried with him a local socialist newspaper with a full-page spread packed with pictures of Michael Brown, Eric Garner, Alex Nieto, and dozens of other young people killed by police in the United States. After de la Cruz finished, Berkeley undergraduate Genesy Melida Hernandez Ceballos felt the need to speak up. “I know how hard it is to be a student. I know personally what it is to struggle as a student and as a parent like El Chilango,” said Ceballos, a 24-year-old native of LA and mother of a 9-year-old. By the time that de la Cruz and his colleagues have finished the rallies, the media appearances, and the hundreds of meetings with local and national leaders, tens of thousands of students like Ceballos will have heard their stories in Houston, Milwaukee, Columbus, Atlanta, Los Angeles, New York, and the other 40-plus cities on the Caravana43 route. Many of these students will be connecting the dots just as she did, despite the absence of national media coverage in the United States and the radically skewed corporate media in Mexico. 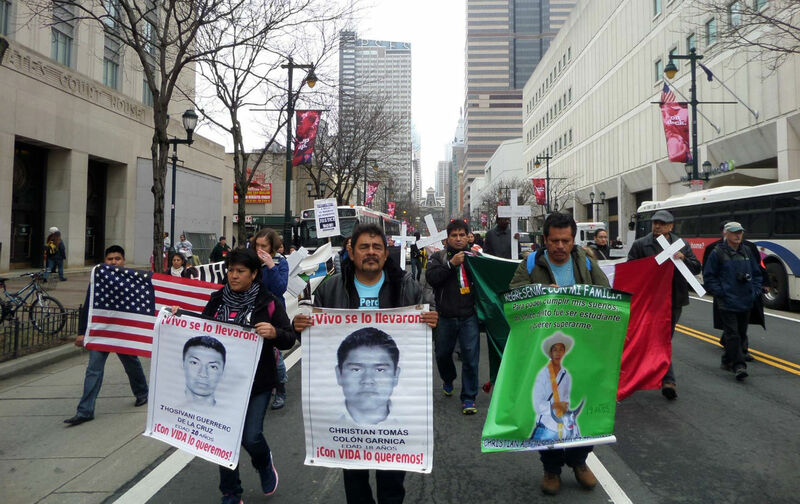 To break the media blockade on both sides of the border, the Caravaneros and their supporters across the United States are deploying a tried-and-true tradition of the Latin American left: the testimonio, the direct, people-to-people process of collectively telling stories that challenge the official narrative in situations involving great trauma caused by political violence. They used testimonio to push back against statements at a November press conference by Mexican Attorney General Jesús Murillo Karam, who declared, “I’m tired” (Ya me cansé) of the investigation into the disappearances the Ayotzinapa students. After the official story was challenged by the story from below, millions more used the slogan “Ya Me Cansé” to express their own indignation at the national trauma symbolized by the personal trauma of Nava, de la Cruz, and other families and friends of the disappeared. More recently, they faced more top-down discouragement from former Mexican president Vicente Fox, who told the US-based Univision network that parents and family members of the disappeared students “have to accept reality” and move on, a message whose timing—right before the launch of Caravana43—de la Cruz, Nava, and other family members of the disappeared denounced during the Caravan. As he looked around the campus, Yosimar was impressed by the “enormous wealth” he saw in the Bechtel engineering building, the Sutardja Dai computer science hall and the other opulent structures of the techno-scientific revolution that are transforming the Berkeley campus, along with the gentrified Bay Area. Yosimar’s curiosity was also piqued by the stories he heard from student organizers who told him about being denied permits to hold their Ayotzinapa event at Berkeley’s storied center of free speech, Sproul Plaza.